Yes, as a kid I used to run to school and back and we were always outside playing chase, tree chase and torch chase when it was dark. Injuries and motivation to get the miles in on days with no training partners. I don’t remember but I wrote them down. 1st 5K 16:25 (at 33), 1st ½ marathon 1:14:36 (at 36), 1st marathon 2:47:33 (at 56). 5. What is your advice for someone looking to improve speed and/or endurance? Run with a group that is pushing your comfort zone. On speed workouts really push yourself and finish the last rep thinking there is no way I can do one more, then do it! With my UK group we used to do a lot of cross country training (hills and speed work on grass). It is really good for strength and endurance and running on road feels so easy after XC season! My prerace mp3 player for getting pumped up. Good idea to rotate, helps to avoid injuries apparently. I try and not wear same pair or even same model twice in a row. It varies with whatever “pump-up” song I’m into. Right now it is “right here right now” by fatboy slim. I always like to be active but have difficulty running unless it is a mountain trail or with a group. If I don’t have someone to run with I gravitate to the bike. Many things – friendship, exploration, a feeling of health and well-being, stress relief, a good hard run in the summer makes an ice cold beer taste good. Paul’s ability to smile ear to ear while running at warp speed is a true phenomenon. 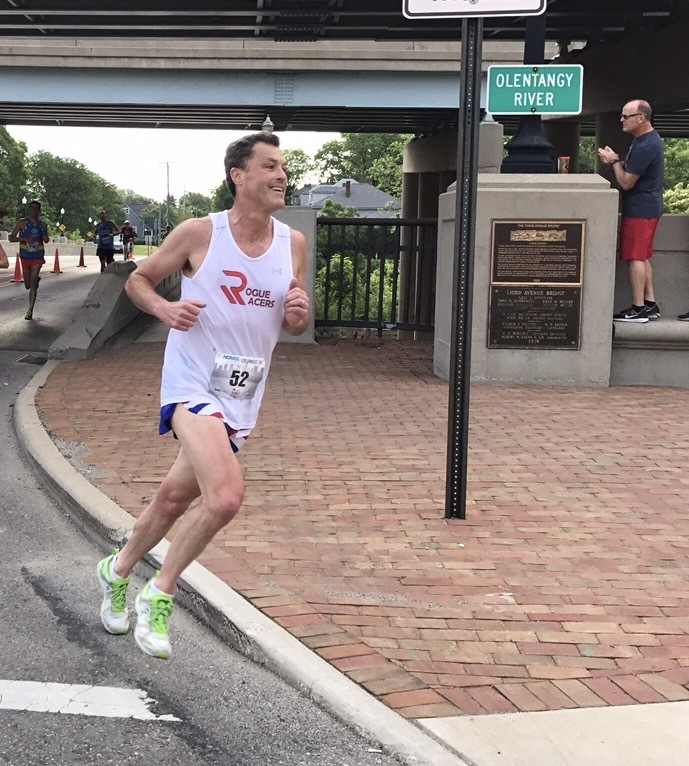 He also holds the Indianapolis Monumental Marathon 55-59 Age Group record with a 2:45:13 and he makes the most delicious scones from scratch. Every team needs a Paul, but hands off, this one is ours.